X-Ray tube with +/- 125,000 slices new in 2002. 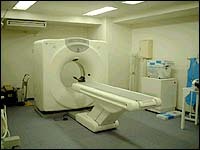 Complete and working CT before removal. IN STOCK IN OUR FLORIDA WAREHOUSE.